Today was a full, well-balanced day. Bex went to the North clubhouse to get her work done. David and I worked from the apartment. Bex’s best friend’s mom — a Cuban American from TN — came over to meet us. They’ve been out here from MON (middle of nowhere), Tennessee, and just decided this week that they are going to give it a go and commit to a year out here. They’re trying to find a small house or apartment. We wanted to meet in case we want Bex living with them at some point. Now this is a great indication of the lengths people will go to pursue a dream. This family — this mom and her 14 year old son and 16 year old daughter — have been living in a studio apartment for a couple of months, with others coming to stay with them on occasion. Their home in TN flooded a few weeks back, while her husband was out here in LA with the kids and she was in AR with her 23 year old daughter and newborn grand-baby, who had been in the hospital for 5 days. They couldn’t do anything about the house, at first — they just couldn’t fly back and forth. People come out here, sometimes, in the strangest of ways. This family actually raised the money to come out here by — not making this stuff up — baking like crazy and selling their delicious food. In fact, they were so successful that they had to consider, for a moment, opening up a store-front bakery! Did I mention that she and her husband — an aeronautical engineer — are home-schooling the two kids? Incredible commitment and support. Absolutely loved her. Solid, salt of the earth. 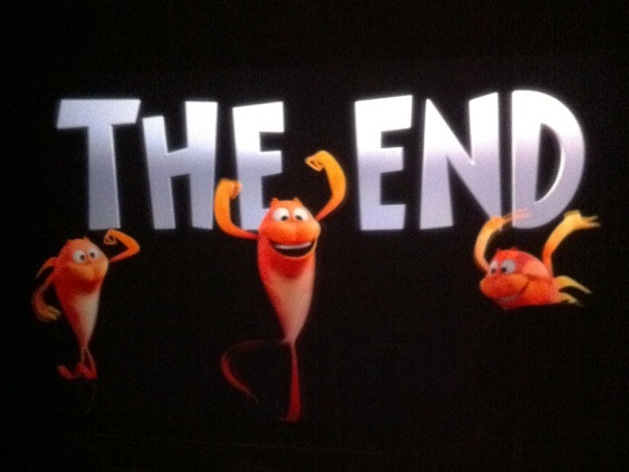 End of “The Lorax” … Photo taken through 3D Glasses. Just before we left, an email came in with an audition for tomorrow night at 7 p.m. Yes, that’s Saturday night at 7. Strange place out here. It is possibly the strangest script Bex has gotten, to date. It appears that Pilot Season is starting to slow down. This was the first week out here with out auditions, and this one is just bizarre. But practice is practice, and Bex will definitely find this one a stretch: a goth “girl-with-the-dragon-tattoo” type somehow encounters and catches the amorous eye of a would-be philandering Abraham Lincoln. And I thought our life was crazy! We went to Universal Studio’s theater, to the balcony, and walked in just before the credits. It was a huge place, but somehow the back row felt like the best seat in the house. We literally got more than 10 people to happily get up and slide down so that David and I could sit together. We didn’t see the girls until after the movie, where we found them dancing under the City Walk screen with some friends. The other cool thing about these kids is that they don’t seem to have the age-restrictions I’m accustomed to seeing in HS. As Bex said, “mom, we’re not agist.” You’ll see a gaggle of kids hanging out and the age could range from 12 to 18. Now, I’m glad my kid is on the older end, not the younger end, but ultimately it’s pretty sweet how they accept and watch out for each other. There are some pieces of work — some unbelievable caricatures. But on the whole we’re meeting a bunch of really good kids out here. They are working hard — they have to be in order to do what they love — and their families are sacrificing much to make it work for them. It’s a much healthier environment — here in the microcosm of the Oakwood, not out there in LA — than I ever suspected it could be.